This paper is the first of a series of papers that extend Dr. Frankl’s pioneer work of bridging between existential traditions and cognitive-behavioral psychology. Meaning-Centered Counseling may be regarded as neo-logotherapy, because it translates and extends the basic tenets of classic logotherapy into cognitive behavioral processes. Such an effort is tended to facilitate and broaden scientific research on the role of personal meaning as well as the efficacy of logotherapy. The days for schools of psychotherapy seem to be over, because an increasing number of therapists are adopting an eclectic and integrative approach. 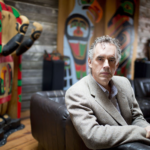 However, a case can be made that specific schools of psychotherapy are going to stay, because they provide a unique set of conceptual and therapeutic tools from which an eclectic therapist can draw. Knowing how to employ a variety of intervention skills does not necessarily make one a competent therapist. Effective counseling depends on case conceptualization and a treatment plan, both of which need to be informed by some theory of psychotherapy. The longevity of each theory depends on its ability to incorporate creative ideas and recent research findings to meet new challenges facing therapists and counsellors. Meaning-Centered Counseling evolves from existential therapy to the extent that it addresses the universal existential concerns, such as meaninglessness, death anxiety, etc. However, Meaning-Centered Counseling may be more accurately regarded as neo-logotherapy, because it embraces the basic tenets of classical logotherapy and adopts a more cognitive-behavioral approach. Although Viktor Frankl has been recognized by some as a forerunner of cognitive-behavioral therapy (Frankl, 1985; Ivey, Ivey, & Simek-Morgan, 1993; Mahoney & Freeman, 1985), he has not been given due credit for being the first person to bridge the gap between existential psychotherapy and cognitive-behavioral theories. Given my background in cognitive-behavioral psychology (Wong, 1995a; Wong & Weiner, 1981), it is natural for me to extend the pioneer efforts of Frankl in this direction. One of the common criticisms of existential psychotherapy is that it is too vague and philosophical and that it is based on insight rather than scientific research. To overcome these deficiencies, Meaning-Centered Counseling attempts to translate philosophical propositions of existential psychotherapy into cognitive-behavioral principles, so that empirical research can be conducted to test the model. 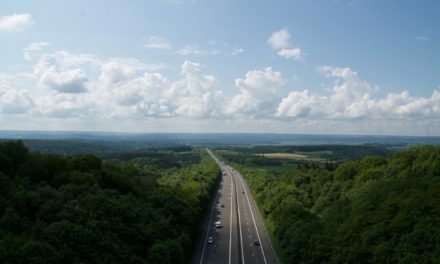 What do we mean by meaning? We need a comprehensive operational definition in order to facilitate research and communication. I have conducted a series of studies on people’s implicit theories of meaning of life (Wong, 1998a). 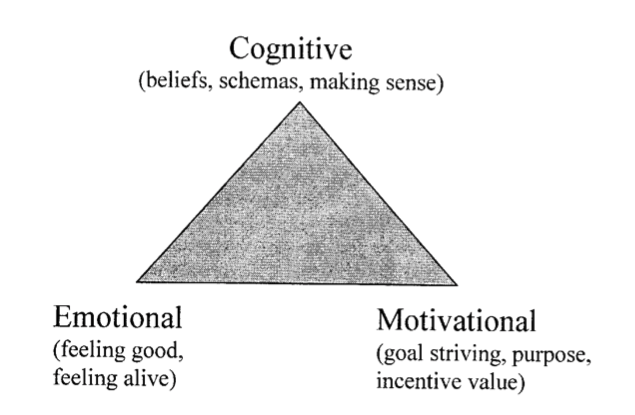 This research program identifies three defining components: cognitive, motivational, and affective, as depicted below. The cognitive component is comprised of beliefs, schemas, and expectations; it includes all the cognitive processes that help people make sense of the world. It enables people to predict and explain events and personal experiences and give them a sense of coherence. It also facilitates the choice of a particular life goal. If I believe that my destiny is to be a musician, then I will be willing to endure suffering and poverty to be what I am meant to be; life would be meaningless and unfulfilling if I were to choose a different path. I believe, therefore I exist. I hope, therefore I strive. I expect, there I act in certain ways. In sum, I am what I think. This cognitive component evolves out of past life experiences and cultural imperatives, and it forms the foundation of meaning structures. The motivational component primarily consists of goal setting and goal striving behaviors. Motivation manifests itself in choice, persistence, and other goal-related behaviors, but stems from cognition. Our core values determine our priorities and purpose in life. We tend to invest time and energy in projects to which we attach value and significance. Values are deeper than attitudes; they reflect our fundamental beliefs, worldviews, and cognitive schemas. Therefore, our goal setting and goal striving are dictated to a large extent by what we think. Meaning is actualized from both the attainment of goals and the pursuit of goals that are consistent with our beliefs and value systems. If cognition is the cornerstone of personality development; then motivation is the engine and the fuel that moves us forward toward our destiny. The affective stage of feeling fulfilled or feeling good about one’s life comes from two sources—beliefs in the significance of life and the actual pursuit of a worthy goal. It is an inevitable outcome of synchronization between positive thinking and purposeful living. For example, if a person believes that his calling is to serve God, and he dedicates his life to the Christian ministry, then feelings of fulfillment should stem from pursuing his vocation. Emotion serves as a barometer of the degree of meaningfulness. How do we know whether we are living a meaningful life? 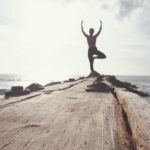 According to the present analysis, all three components must be present—having a set of positive beliefs about one’s life, pursuing what one really wants in life, and feeling good about the way life is unfolding. In terms of structural components, personal meaning may be defined as an individually constructed and culturally based cognitive system, which influences the pursuit of activities and life goals. Positive beliefs and purposeful living inevitable endows life with a sense of significance and fulfillment. Meaning systems are highly idiosyncratic, because that are largely the product of unique personal histories and mental makeup. What is meaningful to one person may be trivial to others. For example, those who have lost loved ones during the war may value a faded family photo more than any other possession. The fundamental assumptions of logotherapy are presented in Figure 2. 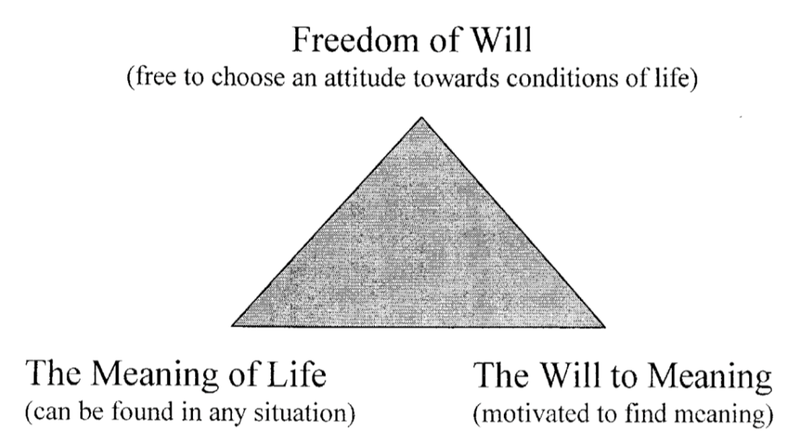 This second meaning triangle explains why logotherapy is “therapy through meaning.” The Free of Will proposition states that individuals always have the freedom to choose a positive attitude, even in the most appalling conditions. This assumption affirms the existence of a healthy inner core and the operation of an indomitable human spirit. Freedom of choice is one of the basic propositions of existential/humanistic tradition, but it is logotherapy which emphasizes the therapeutic imperative of recognizing one’s capacity to choose. Even in extreme situations, there are a minimum of two options: to give up or to fight. However, in most situations, there are several alternate courses of action. Meaning-Centered Counseling almost always asks clients about the cognitive and behavioral options available. Once clients are made aware of these alternatives, they are then guided through an exercise to choose the most responsible and meaningful option. This exercise includes thinking through the consequences of each decision and helps the clients make the most meaningful decision. The Will to Meaning proposition assumes that there is a universal, primary motivation to find meaning. But, if the quest for meaning is universal, wy is it that so many people seem to be so busy with the business of daily living without ever expressing a yearning for meaning? Why do so many people simply enjoy the pleasure of the moment without showing the slightest interest in the weighty questions about life’s meaning? The answer is that the Will to Meaning is a latent motivation, which is often suppressed by survival instinct, the pleasure principle, and the will to power. But when all the things and people that sustain us are taken away, the Will to Meaning often comes to the fore; because without meaning, life would be too painful to endure. The quest for meaning may also be aroused by a spiritual awakening, or a turning point in life, when we realize that we can no longer continue living in the same direction. The need for meaning may be unconscious, or latent, but it is always there. The purpose of logotherapy is to facilitate clients’ quests for meaning. The need to make sense of human existence—“What is the meaning of human existence?” This is the need to discover ultimate meanings of life through higher cognitive processes, such as reflection, introspection, meditation, and spiritual beliefs. This motivation renders the incomprehensible mysteries of life more coherent and comprehensible. The need to make sense of events—“What is the meaning of my experiences? Why do bad things happen to me? Why me? Why now?” The need to construe specific meanings can be met through perceptual and cognitive processes, such as causal attributions and cognitive schemas. This motivation reflects the need to reduce a complex and sometimes disturbing array of events into more predictable and controllable patterns. The need to create meanings—“What is the meaning of my daily life? How can I live a meaningful and fulfilling life? Since life is so short, how should I live?” The need to create persona meanings, not arbitrarily, but based on a person’s past and hopes for the future, can be met through commitment, activities, and validation. Validation means affirmation or reinforcement of one’s pursuit as being worthwhile and significant. This motivation enables one to experience daily living as being meaningful. Meaning-Centered Counseling attempts to address these three primary needs for meaning, as illustrated in Figure 3. These needs are universal because they are rooted in human nature. Human beings are the only meaning-seeking, meaning-making creatures. Meanings are, in many ways, more real and intimate to us than objective reality. What affects us most is not actual events, but our interpretation of these events. We live and operate in two worlds—the world out there, and the world within; it is the inner reality that matters most. The primary focus of Meaning-Centered Counseling is the realm of meanings. Whatever changes clients want to make in their lives have to begin with changes in attitudes and meanings. This is followed by appropriate behavioral changes, which may or may not involves environmental changes, such as job change or relocation. The Meaning of Life proposition assumes that meaning can be found even in the harshest life situation. 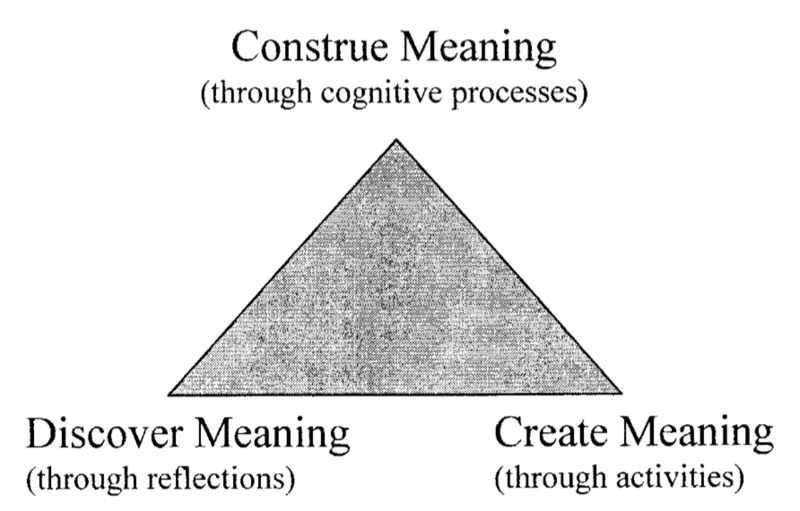 Frankl proposed three basic avenues to find meaning, as illustrated in Figure 4 (Fabry, 1968; Frankl, 1959). This figure is adapted from Wilson (1997) and is self-explanatory. My own research on implicit theories has identified seven major sources of personal meaning: achievement, relationships, intimacy, self-transcendence, self-acceptance, fair treatment, and religion (Wong, 1998a). I have demonstrated that Frankl’s three avenues can be applied to each of the seven sources, resulting in 21 ways of finding meaning (Wong, 1995b). I will report more details in the second paper in this series. In the present paper, I have shown that the basic tenets of logotherapy can be translated into cognitive-behavioral processes. 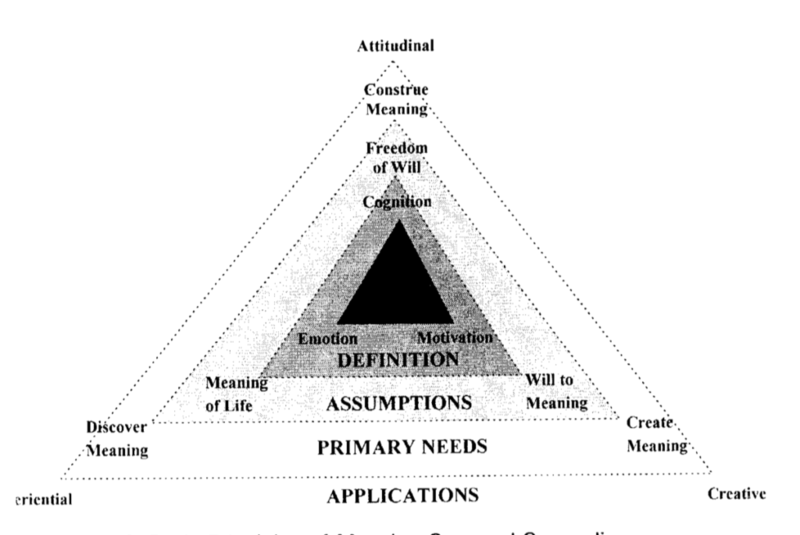 The basic principles of Meaning-Centered Counseling can be represented by a set of four overlaying meaning triangles as shown in Figure 5. 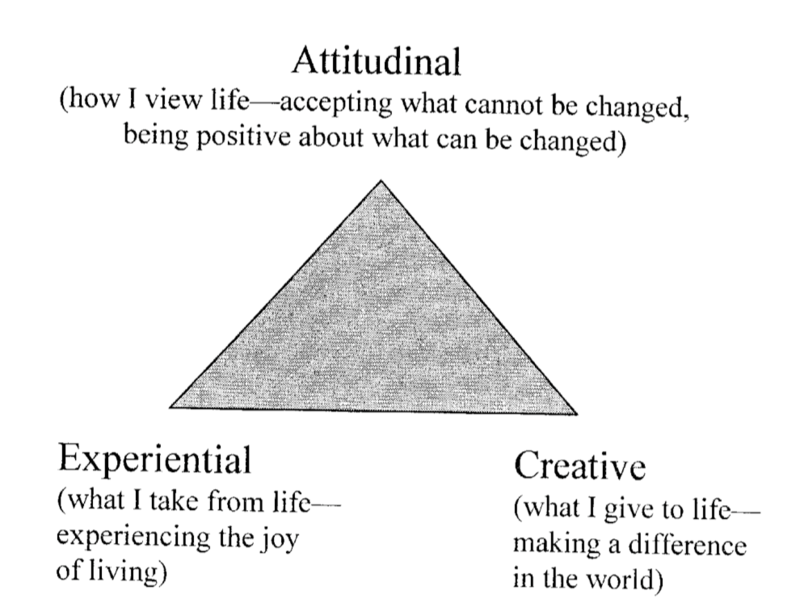 These triangles suggest that meaning-oriented therapy needs to be grounded in a proper understanding of the components of personal meaning and the basic postulates of human nature. It also needs to be built upon the knowledge of the cognitive behavioral processes involved in meeting primary motivational needs for meaning. The application of specific interventions can benefit enormously from such basic understanding and knowledge. Meaning-Centered Counseling is a hybrid of existential-humanistic traditions and cognitive-behavioral developments. It is a natural extension of logotherapy. By translating the basic tenets of logotherapy into cognitive-behavioral processes, Meaning-Centered Counseling hopes to promote systematic scientific research on the role of personal meaning as well as the efficacy of logotherapy. Meaning-Centered Counseling empowers clients to find positive meanings and act on them. The main objective of Meaning-Centered Counseling is not so much problem-solving as fulfilling the basic need for meaning. 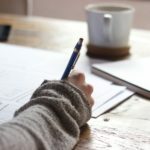 The therapeutic goals of Meaning-Centered Counseling are: a deeper understanding of the problem, a higher level of self-knowledge, a clearer sense of life goals, and a workable plan for desirable changes. These goals are accomplished by applying a variety of cognitive-behavioral interventions (Wong, 1998b). Fabry (1995) has raised a poignant question: “As our century ends, the world is in chaos. Religious conflicts, national struggles, trade wars, cutthroat competition, ecological disasters, crime waves, family breakups—what can put sapiens back into homo?” (p. 7). The study of personal meanings may be an important first step towards finding the right answers. Fabry, J. B. (1968), The pursuit of meaning: Logotherapy applied to life. Boston, MA: Beacon Press. Fabry, J. B. (1995). Prescription for survival. The International Forum for Logotherapy, 18, 7-12. Frankl, V. E. (1959). Man’s search for meaning. New York, NY: Pocket Books. Frankl, V. E. (1985). Logos, paradox, and the search for meaning. In M. J. Mahoney, & A. Freeman (Eds. ), Cognition and psychotherapy (pp. 259-297). New York, NY: Plenum. Ivey, A., Ivey, M., & Simek-Morgan, L. (1993). Counselling and psychotherapy: A multicultural perspective. Boston, MA: Allyn & Bacon. Mahoney, M. J., & Freeman, A. (Eds.). (1985). Cognition and psychotherapy. New York, NY: Plenum. Wilson, R. A. (1997). Finding meaning through Frankl’s Socratic Dialogue and Fromm’s five needs of the human condition: A group process for school counseling. The International Forum for Logotherapy, 20, 28-36. Wong, P. T. P. (1995a). A stage model of coping with frustrative stress. In R. Wong (Ed. ), Biological perspectives on motivated activities (pp. 339-378). Norwood, NJ: Ablex. Wong, P. T. P. (1995b, September). Sources of personal meaning across the life span. Paper presented in the International Congress on Logotherapy, Dallas, TX.